Things didn’t go as planned. Her baby remained “sunny-side up” - or posterior, where the back of baby's skull is in the back of the pelvis - during labor, causing excruciating back pain. The idea of laboring peacefully at home turned out to be anything but that. And now, after a long, painful and extremely difficult delivery, here she was with her days old baby. Her milk had not yet come in. Her baby was frantic and so was she. She had no clue what to do and no one around to turn to for guidance. Then she remembered a pamphlet she had grabbed at one of her classes. Tenth Month Doula Services. 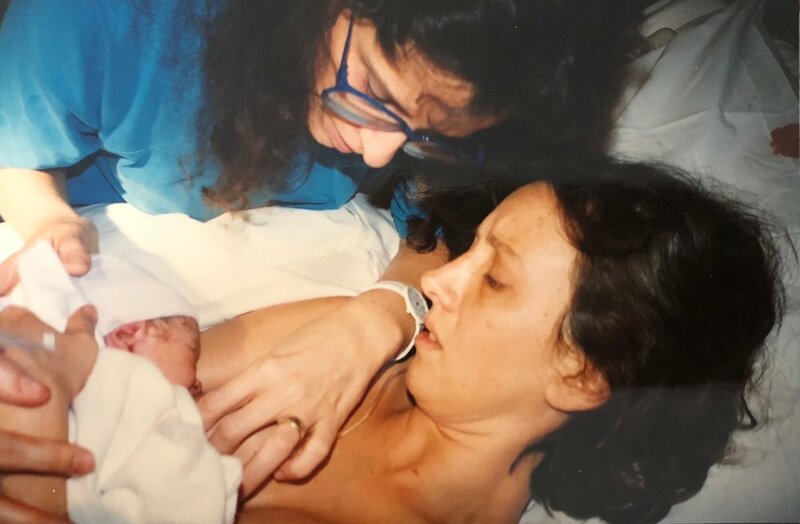 She had been surprised to learn that, in addition to doulas who help during labor, there were postpartum doulas - women who help after the baby comes. She called the owner, Betsy Schwartz, and everything changed. Betsy’s services helped this new mother learn how to comfort her baby, how to make breastfeeding work, and how to rest and recover from a difficult birth. It was an experience that not only changed the trajectory of this mother’s experience with her newborn but it also changed the path of her career. She literally filed Betsy’s information away and, when the time was right, planned to pursue a similar line of work. That new mother was me 24 years ago. And now, two grown children later, I’m celebrating a 15 year career helping new mothers and babies. Keeping twins content while Mommy gets a nap! What started as a sole practitioner helping new moms and babies adjust to the world (First Daze Mommy Care) evolved into a full-blown business with a dream team of exceptionally skilled baby whisperers - postpartum doulas and sleep coaches - helping families all over the Triangle and beyond. Like me with so many of my clients over the years, Betsy and I stay in touch. It turns out, I was her first client though she was good at not revealing that through the care and expertise she provided. I hope my first client would say the same about me. And, like myself, Betsy continues to evolve and change in the work she does with mothers and babies. No longer The Tenth Month, her passion for serving others and making a difference in the world led her to work as a doula trainer, lactation counselor and Reiki practitioner, among other things. Under her current business, Birth in the Know, Betsy created a popular board game called Down the Canal – the Game of Birth which she sells online. Her latest endeavor will be traveling around the country in an RV with her husband and dog, connecting with other birth workers, and creating a life of adventure. The girls kept me company during laundry time! It’s been an incredibly rewarding and fulfilling experience to help so many growing families. (Next goal, counting up how many clients I’ve had!) I am privileged to get to work with so many talented women and meet such interesting people. To those who have been there with me on this journey, I thank you. To those who let me in your door to help you, I thank you. And to those who will entrust the care of your families to my services in the future, thank you, thank you, thank you! !